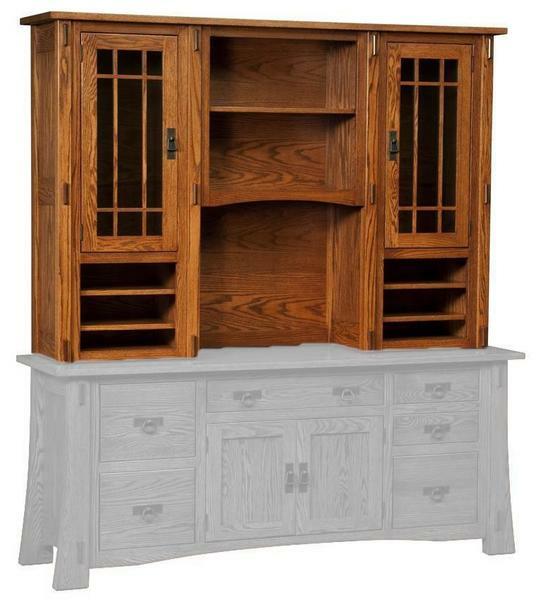 The Amish Modesto Mission Hutch Top is 74" wide and makes a great addition to an executive desk or credenza. It will provide extra filing and storage with spacious slotted shelves and the attractive hutch doors opening to a grand display space. This hutch fits perfectly with our Modesto Mission File Desk and our Modesto Mission Credenza. All of this solid wood office furniture is built by the same wood shop so they fit together like a glove. Beautiful wood mullions grace the hutch doors that house two adjustable shelves inside. Additional storage is added with spacious slotted shelves as well as the display case this hutch provides. A wood hutch adds the room you need to stay organized while adding items like pictures and certificates to personalize your space. Inside Topper Open Area Height: 21 1/2"
Inside Topper Open Area Width: 23 1/2"
I just wanted to express my sincerest thanks to you and everyone there for the beautiful furniture that was delivered this week! No pun intended, but you really delivered! And it was well worth the wait. All of the pieces were everything I expected, and more. The color is perfect and the quality and craftsmanship is fantastic. I want you to know how much I appreciate your help with the order and the amazing work that everyone did to produce my stunningly beautiful furniture. I know I will enjoy it for many years to come. And it makes it all the better knowing it was made right here in the USA! Consider me a most satisfied customer!